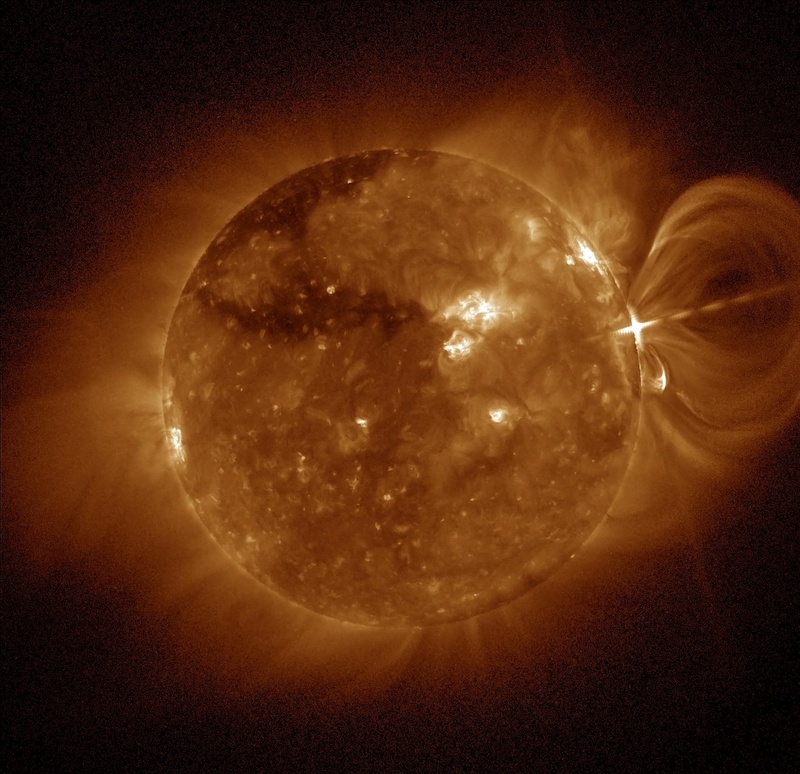 An international group of scientists developed a new method for analyzing the Sun’s energy outbursts, which can help better understand and predict extreme space weather phenomena that directly affect the operation of engineering systems in space and on Earth. The results of their study were published in The Astrophysical Journal. The highest-energy events that occur in the solar system are solar flares and coronal mass ejections (CME) producing a significant release of plasma and associated magnetic field from the solar corona at speeds ranging from 100 to 3,500 km/s. The gigantic solar plasma cloud and the accompanying powerful shock wave can reach our planet in 1 to 5 days, causing severe geomagnetic storms. Solar flares involve the release of a tremendous amount of energy equivalent to that of dozens of millions of hydrogen bombs and exceeding the amount of energy produced on Earth in a year. These energy bursts affect people and electric equipment alike. The effects of solar events on people are confirmed by abundant historical evidence. Back in 1859, the telegraph systems in North America and Europe were knocked out of service by an extremely intensive geomagnetic storm. Another exceptionally powerful CME resulted in spontaneous activation of the US Navy’s mines during the Vietnam War in 1972. In 1989, a geomagnetic storm was blamed for a blackout in Canada, cutting off nearly 6 million people from heat and power supply and radio communications. In October and November 2003, severe geomagnetic storms caused instantaneous disruption of radio communications around the world and interruption of GPS, TV broadcasting and cellular services in several countries. On September 10, 2017, the ISS crew had to move to the station’s shelter to protect themselves from the radiation emitted by the largest solar flare observed in the last 12 years. On that day, high-energy solar particles posing a threat to the crew’s health and the satellite electronics actually filled up the entire heliosphere, hitting the Earth with high radiation. Research into solar-terrestrial interactions is becoming ever more important in the modern society which tends to rely heavily on satellite communications, navigation, Earth/weather/climate monitoring, disaster management and economic transaction services, which ultimately heightens exposure to space weather impacts. Switching satellites to safe mode, turning off sensitive equipment and changing aircraft routes can help fend off the negative impacts of space weather. An international group of researchers from the University of Graz and the Kanzelhöhe Solar Observatory (Austria), the Skolkovo Institute of Science and Technology (Russia), the National Oceanic and Atmospheric Administration and the Cooperative Institute for Research in Environmental Sciences (USA), the Mullard Space Science Laboratory (UK), the University of Kiel, and the University of Potsdam (Germany),the University of Zagreb (Croatia) undertook a large-scale study into the September 10, 2017 solar events and put forward a new effective method that will help explore and predict solar eruptions. In particular, the method enables automatic detection of CME propagating into interplanetary space at extreme speeds of up to 3,500 km/s. The analysis of unique space data revealed extremely fast lateral expansion of the CME, triggering a solar tsunami ‒ a powerful plasma shock wave traveling at up to 1,100 km/s. The CME radial acceleration peak was 5.3 km/s2, while its lateral expansion peak reached 10.1 km/s2 ‒ the largest value in the history of solar observations. “The strong overexpansion and very high lateral expansion in this extreme coronal mass ejection that we derived from the unique set of space-space data, together with the fast shock wave it initiated is most probably a key ingredient for the production of the widespread solar energetic particles, associated with this event, which almost filled the whole heliosphere”, says the first author of the study, solar and heliospheric physics research group leader at the University of Graz and Head of the Kanzelhöhe Observatory Professor Astrid Veronig. “The analysis of extremely fast solar eruptions of September 10, 2017 provided us with new insights into the CME morphology and its propagation in interplanetary space, which is highly important for understanding and predicting extreme space weather phenomena. No matter what storms are raging, we wish you good weather in space!”, says the co-author of the study and Skoltech professor Tatiana Podladchikova. Inspired by the outcomes of this study, the authors of Skoltech’s sci-comics book included a piece on space weather in this unique collection of science picture stories ‒ a collaborative project of Skoltech, Schrödinger’s Cat and Eksmo publishers.